Your wedding day is your day to shine. Don't let it go to waste by not hiring a photographer! Jessica Blalock Photography is at your service, offering you a grand experience with high quality photographs of your next event! 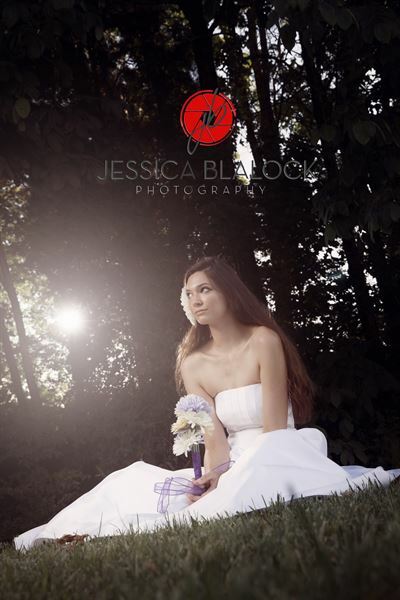 Jessica Blalock Photography is here to help preserve your finest day, into lasting memories for the future. Her elegant style, along with an eye for the little things, is what lets her stand out from the crowd. Jessica will capture your day and all the little moments that go along with it. This package includes your engagement, bridal, and wedding ceremony. Also you can choose to add "Trash the Dress" or Boudoir. Everything is included in this package, and there are no hidden fees. With this you get 6 hours of coverage, including, bride and groom dressing, wedding ceremony, reception. Also you get a second photographer. Along with this, you will receive a designed wedding album, save the date cards (up to 50), and any one extra you would like to add (value up to $100). If a cancellation is needed, it must be one of the following for your deposit to be returned. Life event, as in sickness, or death of family member, injury to the bride or groom. Only under these circumstances will the 200$ deposit be returned. Payment of cash, check, money orders are accepted. Deposit is required to hold the date, and schedule the engagement, bridal, boudoir, etc. The remaining balance will be due the day of the wedding, no exceptions. Mention my facebook page, and receive a free 16x20 print of your choice!